A competitor to Polycarbonate is making strong inroads into the market. The material is known by its trade name Trivex®. Like polycarbonate, Trivex is considered a mid-index material and has inherent UV protection. It’s very low specific gravity, however, can make it as lightweight as many high index materials for a lower cost. Trivex has many benefits lending to its recent popularity. The impact resistance of Trivex is comparable to Polycarbonate. However, using this in place of polycarbonate for children is not recommended at this time. Polycarbonate is still considered the standard of care for children in most ophthalmic circles. We have not been able to find a court case where the selection of Trivex instead of polycarbonate in safety glasses was claimed to have been the cause of an ocular injury. Therefore, there is no precedent to predict how the court system would view your choice of lens material. 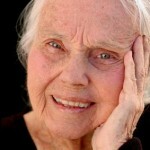 It is always preferable to stay with the standard of care rather than risk setting a precedent in court. Be safe and always use polycarbonate for your under-18 year of age patient and in safety glasses. Its impact resistance, however, is an excellent selling point for those patients who do not fall within the above mentioned polycarbonate-required groups but still want a high safety profile. 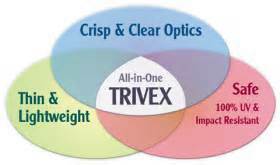 A second benefit of Trivex is its light weight. Although having an index of refraction more similar to standard plastic CR-39 than its’ mid-index sibling, Polycarbonate, the specific gravity of Trivex is significantly lower than polycarbonate and even lower than any high-index material (see Lens Material Choices table). This lower specific gravity in mid range prescriptions, such as +/-3.00D to +/-6.00D could create a lighter weight lens than by using a more expensive higher index material. A third benefit of Trivex is its relatively high abbe value. Compared to polycarbonate and other high index materials with a lower abbe value, Trivex’s higher abbe will create fewer chromatic aberrations. Therefore, consider this lens for someone you deem to be a “poly non-adapt” patient. The term “poly non-adapt” is used for a patient in polycarbonate, usually for the first time, who has vague symptoms of not seeing well despite all troubleshooting efforts yielding no benefit. Many times changing such a patient into a higher abbe value material will solve the complaint.